Abstract: Rapid metastasis contributes significantly to the high mortality rates in lung adenocarcinoma. The present study reports a rare case of primary lung adenocarcinoma with concomitant gastric, duodenal, bone, and mediastinal lymph node metastases. A large gene panel based on the next-generation sequencing was used to detect gene mutations in different metastatic sites and blood. The results showed that the gene mutation spectrums among different metastatic foci were roughly similar. The mutation abundance was highest in mediastinal lymph nodes. Unique mutation sites were detected only in mediastinal lymph nodes, bone, and gastric metastatic foci. Despite partial heterogeneity, there are currently no applicable targeted drugs to adopt. In addition, tumor mutation burden (TMB) showed that blood, gastric, bone, and mediastinal lymph node metastases were all TMB-High, while the duodenal metastasis was TMB-Low. 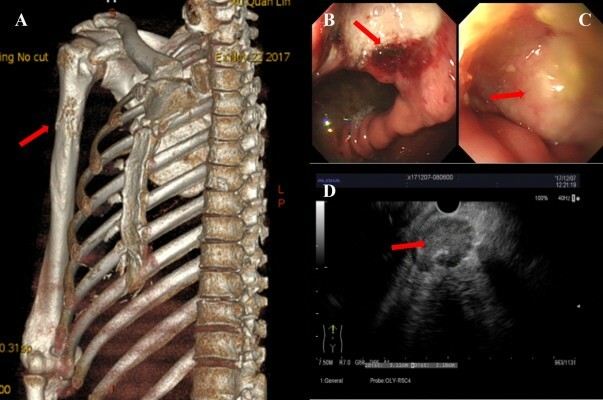 This study is the first to report a rare case of newly diagnosed lung adenocarcinoma with concomitant gastrointestinal metastases and to perform mutation analyses on all metastatic foci. Large sample sizes with similar cases are required to gain deeper insights.